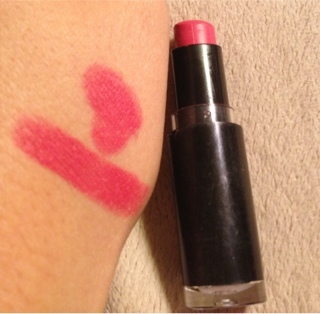 Wet'n'Wild Mega Last Lipsticks are pretty awesome! My favorite lately has to be Smokin' Hot Pink (905D). These are super pigmented and with one coat look gorgeous! It's a beautiful raspberry pink- but it looks brighter in person! Wet'n'Wild is becoming one of my favorite drugstore makeup brands! If you haven't picked any of these up- I can't recommend them enough! I got mine at CVS for $1.99! Am so happy I did! Just as I was getting an email about your comment I was applying my new OCC lip tar in Grandma and had to send it to his twitter- was too funny not to! That looks great on you! I'm not sure if we have Wet n Wild here, if not you may have to send me one in the swap! Thanks! Thought you might like this Claire- we seem to have the same taste in lippies and blushers:) Will def have to send you this one!